In this paper, details are presented for three technical approaches that can be employed in the reproduction of Celtic coins from Britain: 1) the use of pellet trays to produce coin blanks of standardised weight; 2) the use of successive iterations of clay moulds to shrink coin design images while retaining clarity; and 3) the use of a low-carbon steel die that was heated to a plastic state and struck with a cast bronze slug to imprint the design prior to hardening. The combination of these three approaches enabled reproductions that closely match coin finds in the archaeological record and may provide insight into coin minting processes from the Iron Age in Britain. Each of these three areas is described and details are provided for materials and tools employed. The place of coin minting technology as a collaboration between increasingly specialised industries in the context of the social transition from Middle Iron Age to Late Iron Age is briefly considered. The goal of this project was not to create Iron Age reproduction coins using methods that entirely recreate ancient technologies, it was to create coins that appeared accurate. Therefore, our choice for striker assemblage was not based on any finds in the archaeological record and was devised using modern materials, to enable coin production. Celtic coins were only used for approximately 150 years in Britain, and for the first half of that time the coins in use were primarily imported from the continent. Celtic Britons began using imported Gallo-Belgic staters in the 2nd century BC and only began minting coins of their own on a large scale between 80 and 60 BC (Van Arsdell, 1989; Haselgrove, 1993). Minting continued only until the Roman invasion of 43 AD, after which native coin production was replaced by Roman minting. 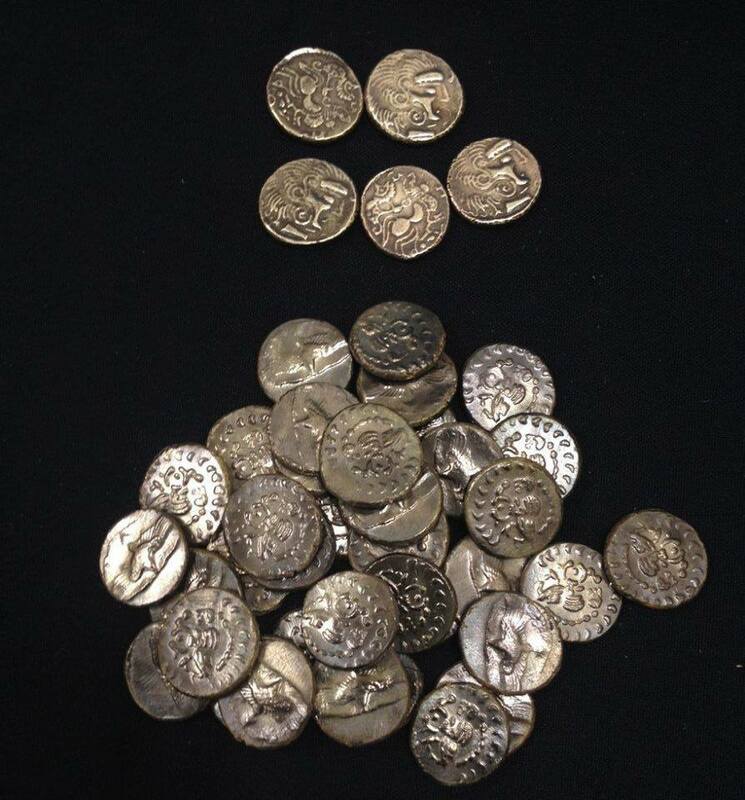 Though brief, this period of Celtic minting resulted in over 40,000 Celtic coins now recorded in the Portable Antiquities Scheme (PAS, https://finds.org.uk/ironagecoins) run by the British Museum and National Museum Wales. Archaeology, anthropology, and numismatics all began as recreational pursuits of wealthy gentlemen, but in the first half of the 20th century archaeology and anthropology developed into increasingly scientific academic disciplines, while numismatics remained in the territory of the collector. Only in the last 40 years has the study of ancient coins begun to be reintegrated with archaeology (Haselgrove and Krmnicek, 2012). This has opened up the field from a primary interest in classification, collection, and resale value to deeper discussions of coinage in the context of the archaeological record and in ancient cultures. Authors began in the 1980s to ask questions such as, “Why was Celtic coinage made, and how was it used?” (Burnett, 1988), yet even now few authors go on to ask how that coinage was made. Publications about Iron Age coins commonly provide one chapter or section presenting a brief description of what is suspected concerning the minting process (Van Arsdell, 1989; de Jersey, 2001) but deep investigations into the mechanics of minting technology are rare in the literature on Celtic coins , with exceptions such as De Jersey (2009), Hill (1922), Sellwood (1963) and Tylecote (1962). 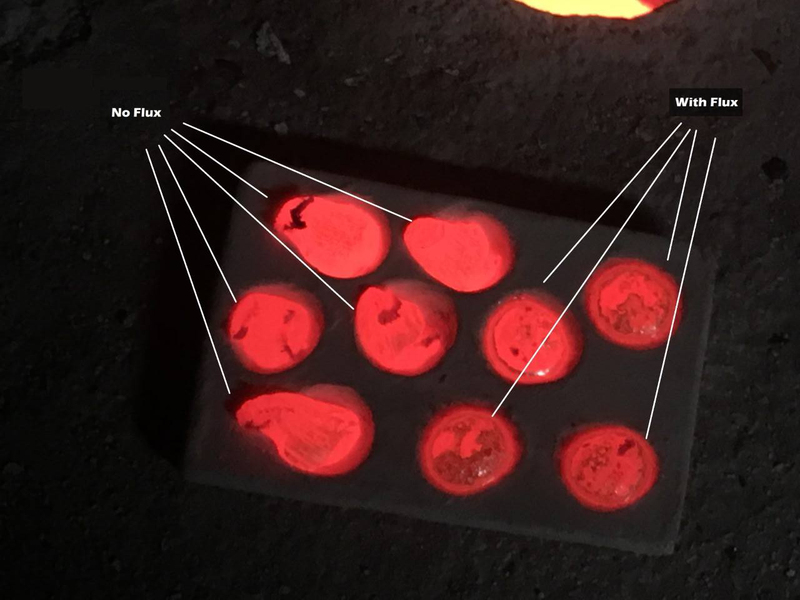 Landon’s (2016) recent investigation of coin pellet moulds has focused on how such moulds were made, marking useful progress in explorations of technical elements of minting. Our work in this paper spans the length of the coin-making process, beginning with the use of pellet moulds to create blanks, through a multi-step process for crafting coin dies, and finally striking coins to create a final product. In so doing we both confirm the likelihood of some previous assumptions and contribute additional possibilities for coin minting technologies. Our work is presented as one possible route for coin production, acknowledging that many other methods were probably also in use. The goal of this project was not to create Iron Age reproduction coins using methods that entirely recreate ancient technologies, it was to create coins that appeared accurate. This paper is a result of discoveries made along the way that we feel may inform the current understanding of Iron Age coin minting. 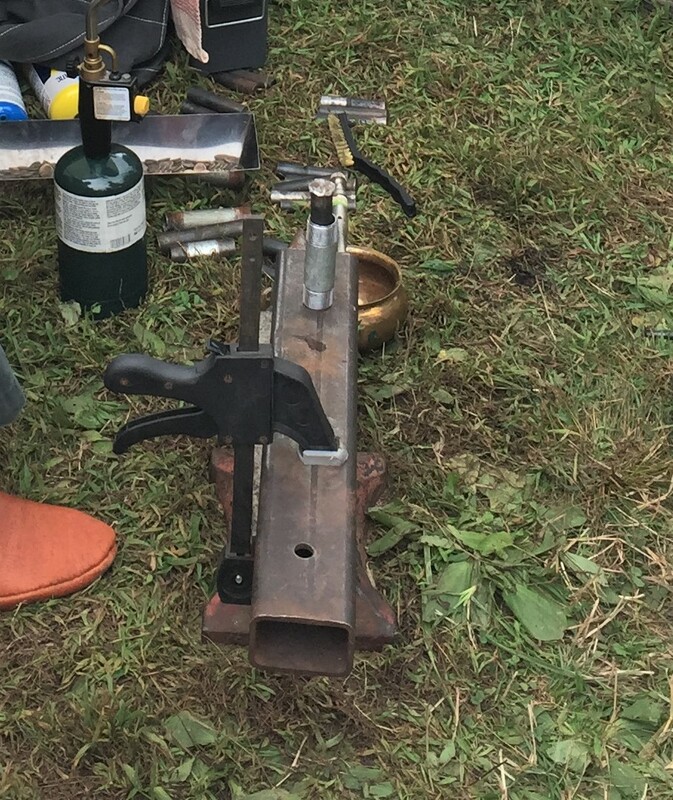 Accordingly, many of the materials and tools we employed are not consistent with Iron Age materials and tools; future researchers are encouraged to take these efforts further by discarding the modern technology we employed in favor of ancient methods for heating metal. For the sake of disclosure, what follows is a list of the main materials used in our project. We used the same kind of copper alloy for coin blanks and for casting in die production: Blue Demon RBCuZn-C X 1/4" X 36" X 10# Box Gas brazing Rod. The omission of zinc in this alloy makes it brass rather than bronze. Our reasons for this choice include price and availability: brass is lower in cost and is more commercially available than true bronze. Many modern alloys referred to by vendors as “bronze” are not simply combinations of copper and tin but also contain additives meant to improve working properties necessary for specific commercial and industrial applications. In addition, the differences between bronze and brass at this scale in terms of malleability, ductility and heat retention are minimal. Our early casting experiments using bronze that was prepared in our own shop by melting together copper and tin revealed that brass easily matched bronze in terms of the level of detail necessary for casting slugs to hub into coin dies. Finally, the composition of Iron Age bronze varies so much that the word bronze has largely been abandoned in favor of the term ‘copper alloy’ in archaeological coin descriptions, so we made the choice to use brass brazing rod as our copper alloy. The use of bronze instead of brass would be a good direction for future research, however and would be especially important for considerations of large scale historical coin issues. For example, in De Jersey’s (2009) feasibility analysis of the Gallo-Belgic-E minting, the use of a metal with a higher melting temperature would impact quantity estimates for wood and charcoal. The low-carbon steel we used was ASTM A36 mild steel. The kiln we used was propane-fired and built according the specifications of Gingery, 1988: Building a Gas Fired Crucible Furnace Kindle Edition. For sandcasting, we used petrobond sand. We used an earthenware terracotta for the pellet moulds we fired ourselves. For outsourced pellet moulds (including those shown in Figures 1, 2 and 3) the potter used grey stoneware. Initially we used terracotta for clay coin designs, but switched to modern, air-drying clay (Sargent 22-2000 Sculpt-it! Sculpting Material) to save time as experiments proceeded. Tools for making impressions in coin design were crafted from wire, metal rods and wood as needed. 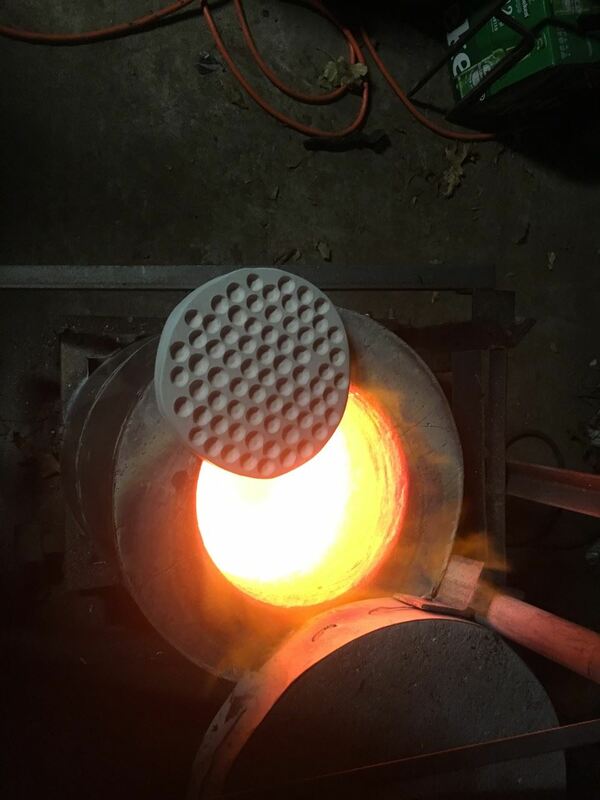 Before a coin can be struck, first coin blanks or flans must be made. Different methods have been suggested for the production of coins, including punching and casting (Collis, 1985), but our explorations centered around the use of pellet moulds. Pellet moulds are ceramic trays dimpled with recesses that have long been assumed to be associated with coin production. They have been found as debris at Iron Age sites throughout southeastern Britain and the continent (Landon, 2016). Presumably by using pellet moulds, a remarkably high degree of standardisation in weight was achieved during the Iron Age within coin issues, such that coins in many issues only vary within a few milligrams (de Jersey, 2001). Additionally, while coins issued by the Atrebates/Regni/Belgae and the neighboring Trinovantes/Catuvellauni tribes differed in size, they were equal in gold content, and thus value, for a period of seventy years (Van Arsdell, 1989) showing that standardisation was even achieved across tribal lines, perhaps in negotiated efforts to facilitate currency exchange and trade. Indeed, the low degree of variation in coin weights allow for deeper analysis relevant to coin production, such as when Williams (2005, p.128) was able to determine that, “Cunobelin’s precious metal coins were produced al marco (a set number made from a fixed weight of metal) rather than al pezzo (each coin weighed separately)”. Measuring granules, powders, or small pieces of pre-weighed cold metal into pellet holes prior to melting allows for a high degree of precision in both coin weight and metallurgical composition. The proposed method of use for these trays is as follows: first, metal (already prepared into a suitable alloy) is measured out into the holes on the pellet mould tray. Then the metal must be melted, either by placing the mould and its contents inside a kiln or by heating the tops of the pellet holes using blowtorches (Van Arsdell, 1989; de Jersey, 2001). While some pellet moulds show evidence of being heated from above (Tylecote, 1962; Landon, 2016), others appear to have been heated in furnaces or kilns (Van Arsdell, 1989). For our project, the moulds were placed inside a kiln (See Figure 1). 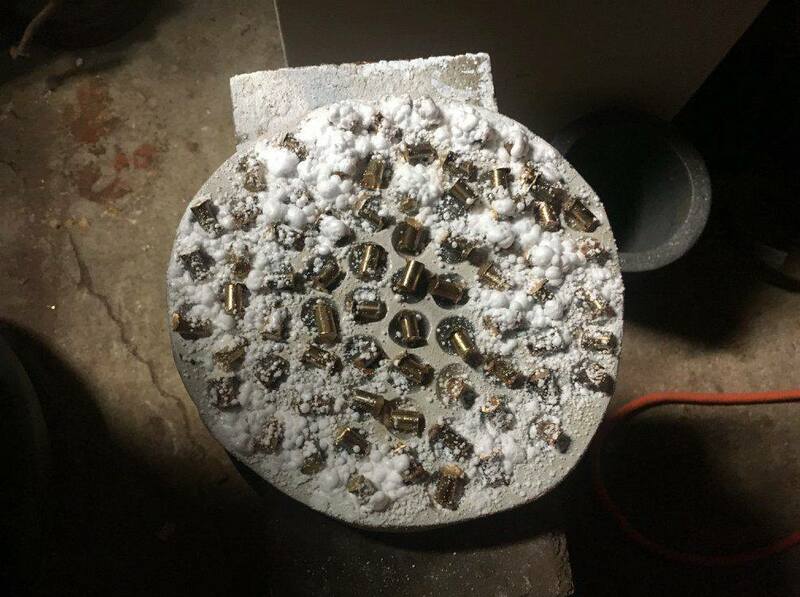 Regardless of how pellet moulds are heated, when the choice of metal is a copper alloy, the addition of a chemical agent is necessary both for helping the molten metal to take on a rounded globular or lenticular shape and also to prevent the metal from oxidizing and fusing to the ceramic surface. Such chemical agents are not necessary for precious metals, so the absence of traces of release agents on some pellet moulds may simply mean that those moulds were used for gold or silver and not copper alloys. Tylecote (1962) used charcoal after noting heavy charcoal residue on original pellet moulds, while Landon (2016) and Van Arsdell (1989) describe calcium carbonate or chalk washes. In our project we used borax (sodium tetraborate), as it was also used in antiquity (Goffer, 2007). In the airtight environment of the kiln, all three are able to maintain reducing conditions that prevent oxidization, improving the shape of pellet formation and facilitating release from the tray. In our project, borax flux allowed the cooled coin pellets to be easily plucked from the tray, whereas without flux, it was necessary to break the pellet mould to obtain an ill-formed blank, resulting in the pellet mould not being able to be used again. These results confirm prior assertions regarding the use of pellet trays (See Figures 2, 3 and 4). Initial pellet trays for this project were made from terracotta to fit the dimensions of our kiln. Trays were left to dry for a week and then fired in the kiln for four hours prior to use. These trays lasted for about ten melts before cracking. Our first trays were not fired in a proper ceramics kiln; instead they were fired in the same kiln used to melt copper alloy for both pellet trays and casting. We assumed a properly fired tray might last longer, so we commissioned a potter to make trays for us. This choice reflects a theme running throughout this project, which is that coin production very likely involved significant amounts of collaboration between artisans in different industries as potters, copper alloy casters and ironworkers all contributed to different stages of work. The outsourced pellet moulds were made of stoneware and fired in a ceramics kiln. They were durable but brittle, tending to flake along the edges, and flux was still necessary to prevent sticking. Landon (2016) has carefully documented the depth and diameter of the holes in the pellet mould debris at Fordham. Some pellet moulds in the archaeological record have deeper cylindrical holes, while others appear to be more rounded. Landon asserts that hole size cannot be associated with coin denomination, which makes sense to us in light of the fact that a coin blank can be larger or smaller depending on how much metal is placed in the pellet mould hole, while coin diameter can be increased through hammering after pellet formation. Results may differ with precious metals, but our experiments with copper alloy revealed that a shallower, rounded hole makes removal of the pellet easiest and facilitates flattening in the next step. Holes in the initial terracotta moulds were 1.5 cm in depth, while revised versions were shallower at closer to 0.5 cm. When pellets are removed from the pellet tray, they are coated in flux, in our case borax, which must be removed. If flux remains on the pellet, any image struck into the coin will disappear when the flux flakes off. Therefore, before flattening, the pellets must be soaked in vinegar overnight to remove borax flux residue. Next, while the use of flux and a pellet mould hole with a rounded bottom both help to make a more regular coin pellet, the shape of pellets when they are removed from the pellet tray after melting is rounded, like a lentil bean. 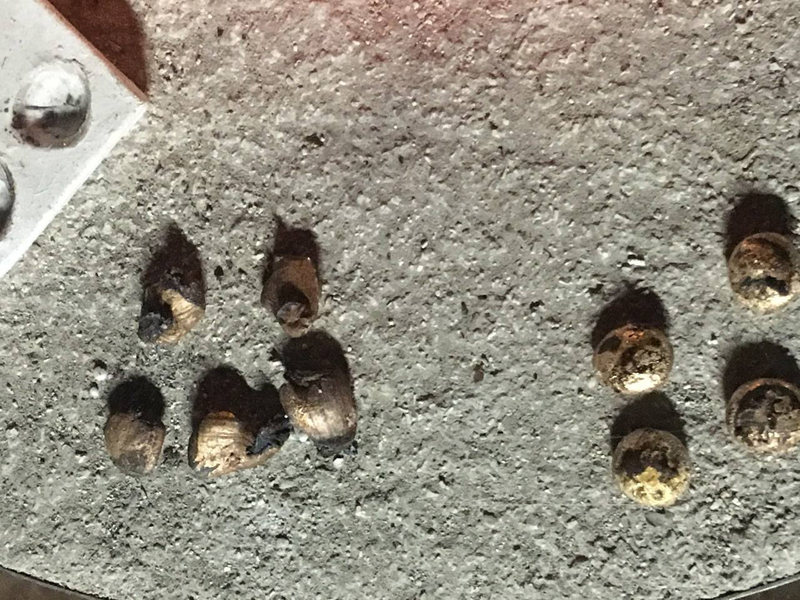 Best final coin results are obtained if these pellets are heated and flattened before striking. We found that heating batches of pellets together in a large dish prior to pounding with a sledgehammer allowed for rapid flattening of coin blanks in quantity (See Figure 5). Celtic coin dies are rare in the archaeological record in Britain. As of 2018, we could only identify five objects classified as Celtic coin dies or punches (Rudd, 2012; PAS records KENT-2EEAF0, NMS-0480E3, CCI-931007, SUR-93184C). They were found in what are now Alton, Andover, Kent, and two from Rotherwick. They range in size from 13-18 mm, yet the silver minim of the Atrebates were much smaller, only 7 mm in diameter, and still possess remarkably fine detail. How did the ancient Celts make detailed coins so tiny using the tools at their disposal? It is difficult to even assess the level of detail for the smallest of these coins with the naked eye, yet somehow ancient Celts were able to produce them in the absence of either magnification or modern carving tools. While some authors have proposed inherited myopia in cultures that produced generations of craftspeople in the same families (Gorelick and Gwinnett, 1981), another possible answer for how this was done relies on clay shrinkage. Shrinkage is a result of the increase in density that occurs when soft wet clay hardens into dry fired ceramic. Some particles in the clay actually shrink themselves, while other particles draw closer together. The amount of shrinkage depends on many factors, including the type of clay, the amount of water in the clay, and the temperature at which it is fired. This property of shrinkage is well-known to potters, and guides for clay shrinkage advise testing each batch of clay to determine the rate of shrinkage if precision in size is a priority (Hansen, 2008). When clay is used to create coin designs that are pressed into sand as part of sandcasting, then the property of clay shrinkage can be exploited to reduce the size of coin designs. After a series of failed experiments involving pressing reproduction coins into sand or attempting to carve designs into sand directly, we settled on clay as a useful medium for generating coin designs. First, a design is pressed into clay to form a negative (recessed) image (See Figure 6). This is done using tools similar to leatherworking punches that end in a few simple shapes such as crescent, wedge, bar, and dot (See Figures 7 and 8). A few attempts were made to sculpt or build a positive image coin, however building a coin proved to be considerably more difficult than pressing shapes into a negative-image clay mould. After this negative-image mould dries (and shrinks a little), a clay coin can be made by pressing clay into the empty space. Due to the property of clay shrinkage, the clay coin, when it dries, will be smaller than the clay mould. Next, the dried clay coin is itself pressed into wet clay to make another mould. After drying, the second mould will be even smaller than the clay coin. This process of successive clay moulds can be performed numerous times to reduce the size of coin designs without loss of image clarity. The final clay coin can then be used to press an image into sand to create the slug used for hubbing a low-carbon steel die. To test this theory, a coin was reduced from an original mould size of approximately 20 mm to a final coin size of 7 mm in an attempt to match the 7mm silver minims of the Atrebates (de Jersey, 2001, p.12). This took four moulds, resulting in four clay coins (See Figure 9). The image retained on the 7 mm coin matches the level of detail on the Atrebates coin so this method, or parts of it, could theoretically have been employed by Atrebates coin minters. There was no qualitative difference in the property of shrinkage between terracotta and modern, air-drying clay. We are not aware of any evidence from the archaeological record for this kind of clay shrinkage employed in coin minting but if such evidence were found, it would appear similar to the ceramic objects in Figure 9. All of the Celtic coin dies and punches from the archaeological record are made of a copper alloy that would have been too soft to strike more than two or three coins made of silver or gold each, much less the thousands of bronze coins we know were minted by Celts such as Cunobelinus in the first century CE (Morris, 2013). Some of the dies are obverse, with a negative image recessed into the mould, while at least one has a protruding positive image. Were these copper alloy objects really used to strike coins, or might these finds represent a different part of the minting process? A series of attempts allowed us to develop a theory for production of a durable coin die. First, a negative/recessed image copper alloy coin die was sandcast. This resembled the Rotherwick and Alton dies because the image was recessed into the metal plug. However, when struck on a cold copper alloy coin blank, the image on the die immediately flattened and distorted and the image transferred to the coin was poor. When a new die was struck on a heated copper alloy coin blank, the image transferred well, but only one good strike was possible. The second and third coins struck demonstrated progressively worse image quality as the die again flattened and distorted quickly. After three strikes the die was no longer usable. This method could not have been used to strike any quantity of copper alloy coins. No Celtic coin dies made of iron have been found in the archaeological record in Britain. However, the time period in question lies within the late Iron Age, when smiths were more than capable of producing the small amount of iron needed for a coin die. In addition, the PAS refers to five Roman dies made of iron, found at Creslow, Wing, Bucks and Fenny Stratford (cf. BUC-FC9DEF record in PAS). These are dated to AD 43 to 410, so they represent evidence that the technology for producing iron dies existed during an adjacent period of Romano-Celtic mutual influence. Subsequent attempts to create dies for this project employed iron. To create an iron die, a positive/protruding-image copper alloy coin punch was sandcast. This punch resembles the object found in Andover and a similar “coin matrix” from Bulgaria by virtue of being positive-image. The Andover find is referred to as a coin punch, rather than a die, because the positive image means it could not be used to strike a coin. We refer to the copper alloy positive-image object we made as a slug, due to its bullet-like appearance, although it could just as easily be called a punch. In our project the slug was struck or “hubbed” into the end of a heated wrought iron plug, creating a negative/obverse image die. The wrought iron die thus obtained was then used to transfer images to 75-80 heated copper alloy coin blanks, before the die cracked and split too much to be usable. While certainly an improvement over a copper alloy die, this method still could not have produced the large-scale bronze coin mintings of Cunobelinus, which number in the thousands. Low-carbon steel was produced in small quantities during the late Iron Age in Britain. Analyses of European swords and daggers made prior to the Middle Ages reveals a mix of untreated, quenched, slack-quenched, and heat-hardened low-carbon steel (Lang, 1987; Pleiner, 1993). Smiths were not yet able to consistently and reliably produce the high temperatures, forge structures, or tempering techniques necessary to produce bulk quantities of well-tempered high-carbon steel with superior flexibility, strength and hardness. However, brittleness from inexperienced quenching may have been less consequential to an object with the stocky shape of a coin die than it would be for a long slender sword blade. It is conceivable that a low-carbon steel die, hardened by quenching in water, could have been produced and employed by Celts in the making of coins. Authors disagree on whether ancient steel with a carbon content below 0.3% should be properly called wrought iron or low-carbon steel, but here we use the term low-carbon steel because that is the nomenclature of the modern vendor supplying the steel used to make the final, and most effective die in this project. Similar to the wrought-iron die, for the steel die again a positive/protruding-image copper alloy coin slug was sandcast. The slug was first pounded into the end of a heated low-carbon steel plug to create a die. The die was then heated back up, and quenched in water to harden the steel. This die has successfully been used to mint over 700 heated copper alloy coin blanks and should be viable for hundreds more. Early estimates that one die produced 10,000 strikes (Sellwood, 1963) were later reduced to 1,000 per die by Haselgrove (1984) and this figure is quite plausible based on our experiments. Interestingly, after several hundred strikes, these low-carbon steel dies begin to wear at the edges, which causes coins struck with them to buckle into a concave shape. It has been suggested that coins had concave shapes because they were pounded between one die with a concave surface and one die with a convex surface (de Jersey, 2001), but our research suggests that concavity may be a natural consequence of a well-used die. Once dies have been created for both sides of the coin and blanks are prepared and waiting, the components can be assembled for striking. The blank must be placed between the two dies and struck with a hammer so that designs are imprinted on both sides. Hill (1922) reviewed iconographic evidence for coin minting processes and presented a variety of designs for the assemblage of pile anvil (the base of the coin-striking assemblage) and trussel (the top part which is struck with a hammer) based on marks he observed on the edges of struck coins. Roman assemblages were sometimes hinged such that both sides of the die were connected, or the bottom half of the assemblage possessed a spike that could be driven into a solid base such as a wood stump for stability. De Jersey presents a design drawn by Simon Pressey (2001, p.11) showing a wider pile anvil and narrower trussel. Implicit in all of these designs is the understanding that the three elements of bottom die, blank and top die are unstable when stacked, and will have a tendency to topple over and possibly send parts flying when struck with force from above. 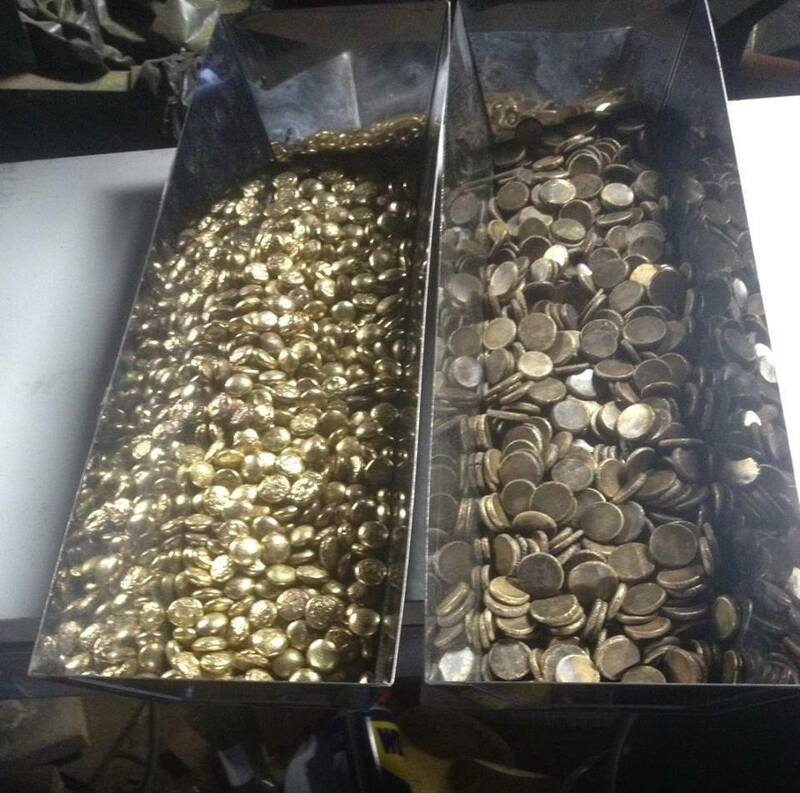 Some method for stabilizing the assemblage is necessary to accomplish repeated and rapid striking when producing a larger batch or issue of coins. As stated above, the goal of this project was not to create Iron Age reproduction coins using methods that entirely recreate ancient technologies, it was to create coins that appeared accurate. Therefore, our choice for striker assemblage was not based on any finds in the archaeological record and was devised using modern materials, to enable coin production. For the pile anvil, we drilled a hole in the side of a section of squared pipe. This is placed horizontally on a stable surface with the hole pointed up. The bottom die is placed in the hole so that it rests on the inside of the pipe and extends upwards through the hole. Then a smaller section of rounded steel pipe is slipped over the exposed portion of the bottom die. 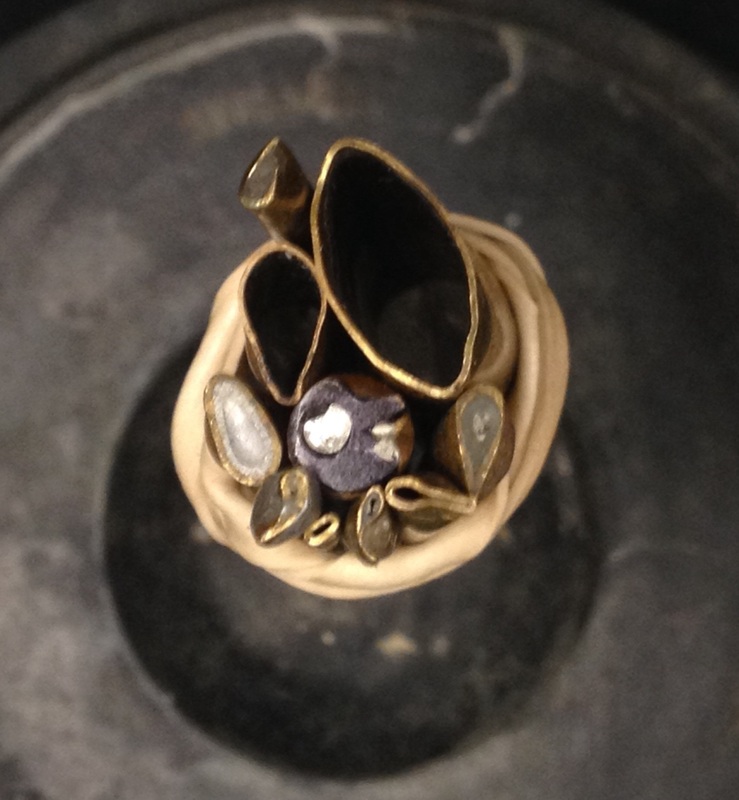 The round pipe is longer than the exposed part of the bottom die but short enough that when the heated coin blank and top die are dropped inside, the top die remains exposed enough to allow for striking. In this way the components are held steady so that attention can be directed to striking with sufficient force and aim to make a good impression on the coin. Our assemblage is shown in Figure 10. This element of our coin minting is efficient, especially when stabilized with modern clamps. It could theoretically have been used in antiquity, but to our knowledge, objects resembling our striking assemblage neither appear on ancient images of coin striking, nor have they been found in archaeology associated with coin minting sites. This paper presents explorations of pellet mould use, clay shrinkage in die design, and low-carbon steel dies. The questions driving our work were: in the brief period during which Celtic coins were minted in Britain, how were those coins made, particularly struck coins? How were coin blanks or flans produced prior to being struck? What was the process for making a coin die, out of what materials? How were dies used? 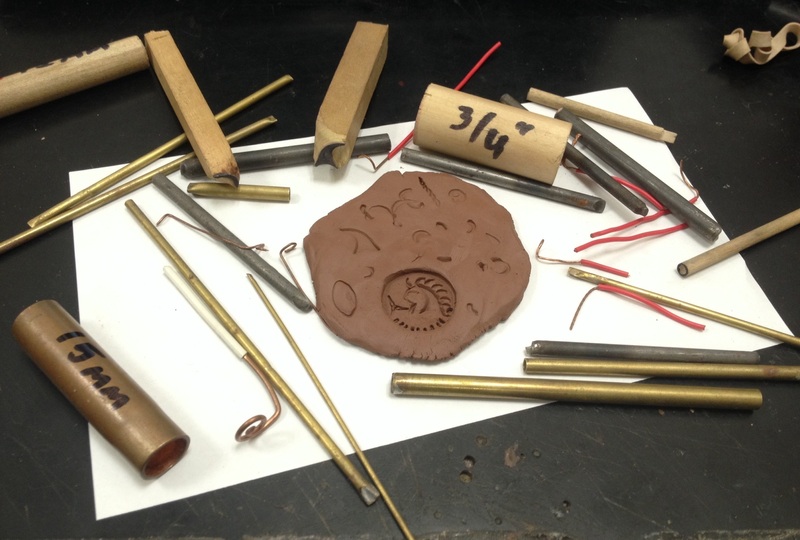 Fig 11 shows an example of the four artifacts created using our process for any one coin issue: the clay coin, copper alloy slug, steel die, and resulting coin. Table 1 summarises the steps in our process. Our final process presents one path to coin production and offers potential ways to fill gaps in the current understanding of ancient Celtic coin minting. In particular, the exploitation of clay shrinkage properties suggests a way in which coin designers were able to retain clarity on the smallest coins. In addition, the use of a cast copper alloy slug for hubbing into a low-carbon steel die suggests a method for producing coin dies of sufficient durability to strike higher quantities of coins. It should be emphasised that multiple paths existed and were probably used for each part of the minting process during the Iron Age, and our method can be considered one of many options. Our goal is to present an approach that was successful along with some lessons learned. As early as 1922, Hill proposed a method for Graeco-Roman coin design that employed smaller hubs (equivalent to our slugs) prepared for different design elements on coins, although he thought harder steel hubs would be used to make impressions on softer bronze coin dies while we did the reverse, making impressions into steel using copper alloy. Hill imagined a mix-and-match approach whereby new coin designs could be produced rapidly using novel combinations of existent hubs, when a new ruler demanded novel coin issues. This could represent a direction for future research. An important thread running through this work is the collaborative nature of the minting endeavor. Minting coins required contributions from skilled craftspeople in multiple industries, including potters, bronze smiths and ironworkers. Potters were needed to create pellet moulds and possibly to assist with the portion of coin image design that requires clay. Bronze smiths were necessary to cast copper alloy slugs for hubbing into steel coin dies, to melt coin blanks in the pellet moulds, and to heat those blanks and hammer them flat. Ironworkers were necessary to prepare the steel coin dies and harden them after an image was impressed. This excludes the workers necessary for production of the metals needed to begin these processes in the first place. While it is possible that specialised minters developed expertise across different industries, it is also possible that different portions of the minting process occured in workshops separated at some distance from each other. Indeed, although pellet moulds have long been associated with coin production, surveys of continental evidence demonstrate that coin dies are rarely found together with pellet mould debris (Haselgrove, 2017). The suggestion that collaboration was necessary between individuals skilled in different specialised industries fits in well with our understanding of the time during which coin use began in Britain. Coins began to be imported from the continent during the transition from Middle Iron Age to Late Iron Age. This transition, occurring in the 3rd to 2nd centuries BC, was marked by changes across a variety of domains. In animal husbandry, the majority of animals kept shifted from sheep to horses. Hilllforts only intermittently occupied for defense and conducting business were abandoned and instead undefended, low-lying oppida were built and occupied. The predominant means of aquiring external goods to support chieftanship shifted from raiding to trading. Status differentials increased, and more egalitarian societies became more highly stratified, as evidenced by new burial practices also imported from the continent. Crafts that had been incorporated into homesteads were increasingly specialised into separate industries. Creighton (2000) makes a good case for coin use being relevant to, and integrated with, many of these changes, from the horses that appear on so many early Celtic coins, to the use of currency to pay for specialised goods and services, to the reinforcing of status differentials in the new, more specialised economy. Other authors have commented at length on the relationship between coinage, power and identity in the Late Iron Age (Creighton, 2000; Howgego, Heuchert and Burnett, 2005; Guest, 2008; Morris, 2013). Coins are one of the few craft domains where it is possible to identify artifacts that were clearly commissioned by political leaders, which adds yet another layer of social collaboration. It is our view that the technology of minting, dependent as it may have been on increasing levels of specialization, also fits well into this view of the Late Iron Age in Britain. Weigh small amounts of metal and place them in dimples on the pellet mold tray. Apply flux to the metal-filled tray. Place the tray in the kiln to melt the pellets. Remove the tray and allow pellets to cool. Remove pellets from the tray and soak them in vinegar overnight to remove flux. Heat the pellets and pound them with a sledgehammer while hot to flatten them. Press clay into the mold to make a clay coin; let the clay dry and fire if appropriate. Repeat steps 1 and 2 as necessary until desired reduction in size is achieved. Place the clay coin in the bottom of a two-part sandcasting tray and press the sand on top. Flip the tray and apply talc on the surface with the back of the coin exposed. Stack the second half of the sandcasting tray on top of the exposed coin, and add more sand. Separate the two parts of the sandcasting tray and cut a cylinder shape above the clay coin. Remove the sand cylinder and remove the coin. Reassemble the tray and pour molten bronze into the cavity to produce a slug. Let cool and remove slug from tray. 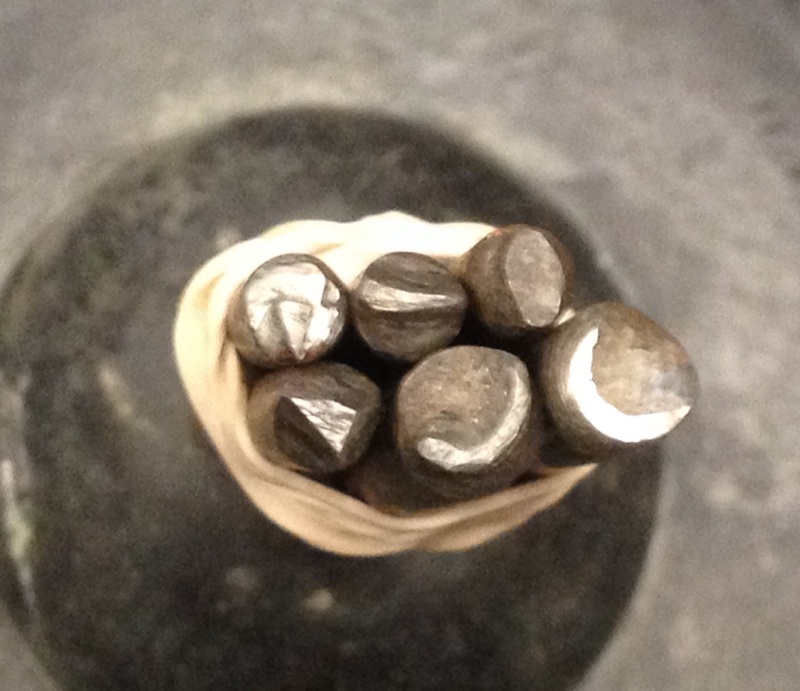 Pound the positive-image slug into the heated end of a low-carbon steel plug to create a die. Heat the die and quench it in water. Drop the bottom die into a hole in the pile anvil. Slip a round pipe cut to the correct length over the bottom die extending upwards. Heat the coin blank until it is red and drop it into the pipe. Quickly drop the top die into the pipe. Quickly strike the assemblage with a hammer. Lawrence Herzman investigated and developed coin production methods and took all the photographs for this project. Monika Townsend documented the process and wrote the text. We received assistance in metallurgical theory from Ben Abbott and Kelly Thomas. Creighton J. 2000. Coins and Power in Late Iron Age Britain. Cambridge: Cambridge University Press. de Jersey, P. 2001. Celtic Coinage in Britain. Buckinghamshire: Shire Publications. Goffer, Z., Winefordner, J.D. and Dovichi, N.J. 2007. Archaeological Chemistry. 2nd edition Hoboken: John Wiley & Sons, Inc.
Hill, G. 1922. ‘Ancient Methods of Coining’. The Numismatic Chronicle and Journal of the Royal Numismatic Society, 2, pp.1-Vii. Howgego C., Heuchert V. and Burnett A. (eds), 2005. Coinage and identity in the Roman provinces. New York: Oxford University Press. Landon, M. 2016. Making a Mint. Comparative Studies in Late Iron Age Coin Mold. Oxford: Archaeopress. Pleiner, R. 1993. The Celtic Sword. Oxford: Oxford University Press. Rudd, C. 2012. ‘Another Forger in North Hampshire?’ Coins Weekly [Online] <http://www.coinsweekly.com/en/Archive/Another-forger-in-north-Hampshire/...> [Accessed 1 June 2018]. Tylecote, R. 1962. ‘The Method of Use of Early Iron-Age Coin Moulds’. The Numismatic Chronicle and Journal of the Royal Numismatic Society, 2, pp.101-109. van Arsdell, R.D., 1989. Celtic Coinage of Britain. Spink: London.